Keri shown with some of her donations. A young teenage girl raised thousands of dollars to buy high-tech gadgets for the young patients at a local hospital. Keri Jucha raised $7,000 for her project. 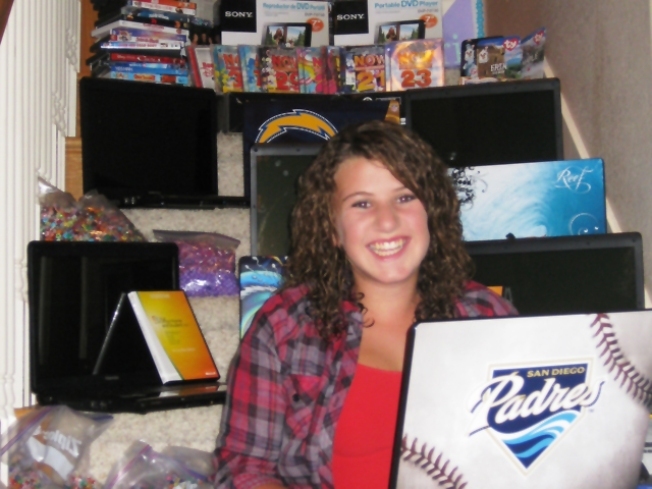 On Wednesday, Keri will deliver 10 Toshiba laptops and five DVD players to Rady Children's Hospital for the patients to use, and a host of DVDs as well. The 13-year-old is a former patient at the hospital and used her bat mitzvah money to help buy the technology for the ailing kids. Keri was 11 in August 2006 when she collapsed while out shopping with her mom, according to hospital officials. She was later diagnosed with a brain infection which caused an abscess on her brain. She responded well to treatment, though, and was released nine days later. Wednesday's donation is not the first time Keri has shown her altruistic side. In February 2007, Keri donated a DVD movie projector to the hospital that was paid for with money she raised in an online auction of necklaces and bracelets she had made. "They don't have DVD players in the hospital rooms, so I wanted the kids who were sick to be able to watch movies on a big screen,” Keri said at the time.